Today Tommy Hyland is well-known as the most successful blackjack team manager in the history of this card game: his blackjack team has been beating a lot of casinos out of their money both in the USA and abroad for more than 25 years already, which can be called to be a great example of successful blackjack players. This is the longest-running and most popular blackjack team in history, maybe even more popular than famous MIT team. What is the secret of such a success? Well, it seems that Tommy Hyland had really deserved the membership of the Blackjack Hall of Fame: he is a head of this blackjack players team of more than 20 people, its trainer and administrator; Tommy’s organization skills, loyalty and ability to deserve the trust of people really impress! In spite of all difficulties the team had to overcome, they are still together and continue putting a fear into casinos all over the world. How the team was born? In 1978, young Tommy Hyland had read the book of Lawrence Revere Playing Blackjack as a Business and understood that he wanted to earn money for living with the help of this card game. Inspired also by other famous blackjack authors, such as Stanford Wong and Ken Uston for example, Hyland had understood all the importance of blackjack team play. He decided to gather his own blackjack team, teach them and begin winning blackjack as soon as possible. The first Hyland’s team was of 4 members and was gathered in 1979: Tommy himself, his friend Leo and two card counters Doug and Dave, whom he met in Atlantic City. Each of them put $4 000 as a start capital, and less than in a year $16 000 had easily turned to be $50 000. All members of Hyland’s blackjack team read different books of blackjack gurus, and after reading the book of Ken Uston Million Dollar Blackjack they had understood it was a high time to leave Atlantic City for much bigger money of Las Vegas, Nevada. But first, Tommy had to find other members for his team as Doug and Dave decided to quit this blackjack team and look for some luck independently somewhere in Asia. Being a good manager, Hyland knew what to do – to hire other team members from his golf club friends. Now, there were about 20 people at the team, and Tommy managed, organized everything and taught new members by himself. Hyland’s blackjack team used many different techniques to play blackjack, such as shuffle tracking, key-carding, big player, card counting and computer play. They were perfect in their knowledge and they beat different casinos out of really big money counted by millions of dollars. 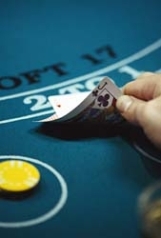 Well, the more they won – the more they bet; and this fact could not stay unnoticed by casinos of course: casinos security became more attentive to Hyland’s blackjack team. The well-known fact is that its members were banned and even arrested though anyway continued to exist and play. Some more details about poker successful players and the stories of prominent gamblers look for at onlinecasinosdoc.com.au - all about professional online and land casino gaming. There you can find even some more articles about Hyland's biography with the details that we could miss. Hyland’s blackjack team continues to play even today: it can be met in different casinos all around the USA; and Tommy himself stays its strong supporter and a fighter for all blackjack players’ rights.